Out-of-body experiences (OBEs) are an unusual group of experiences occasionally reported by some people awakening after general anesthesia. Awareness occurs during 3.2:1000 general anesthetics, and of these people, only 0.7% report undergoing an OBE during general anesthesia. This is an incidence of about 22.4 persons per million general anesthetics. So these are not common experinces. Each year in the USA, at least 20 million persons undergo an operation under general anesthesia. This means that about 20 x 22.4 = 448 persons undergo an OBE during general anesthesia per year in the USA alone. This is a lot of people, and means that most people never report their OBE. Here is a typical example out of my own anesthetic practice. A young woman once told me of an out-of-body experience she underwent during a nose operation for which I administered general anesthesia. Her experience demonstrates all these aspects of out-of-body experiences occurring during general anesthesia. I was fascinated by this report, because I finally had an account of an out-of-body experience where I knew all the circumstances surrounding the reported observations. So what happened to this woman before, during, and after her operation? She was fully conscious when brought into the operating theatre. General anesthesia was induced. Her blood pressure, blood oxygen content, heartbeat, as well as the concentrations of inhaled and exhaled oxygen, carbon dioxide, nitrous oxide, and other anesthetic gases were continually measured. She was aroused from the general anesthetic upon completion of the operation. We brought her to the recovery room only after she was fully conscious. And there she reported undergoing a short out-of-body experience during her operation. Her blood pressure, blood oxygen concentration, and blood carbon dioxide concentration remained normal throughout the operation. 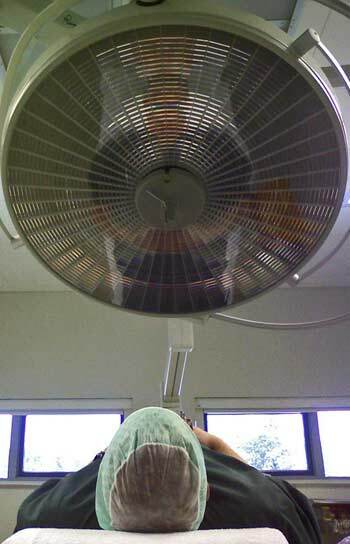 No-one in the operating theatre observed anything unusual during the operation. No-one saw her soul standing next to the operating table. Her body remained upon the operating table during the operation. She could not move, breathe, or speak during the operation, because she had received a drug that almost totally paralyzed all the muscles of her body, and was being mechanically ventilated through a tube placed between her vocal cords. But shortly before the end of the operation, when the effects of all the drugs she received were partly worn off, she made slight movements of her arms and legs. So, just in case she was awake, the anesthetic assistant promptly administered an extra dose of a powerful sleep inducing drug (see the actual anesthetic chart on the right). Otherwise there was no reason to think she was conscious at any time during the operation. She was only capable of speaking after she awoke from the general anesthetic. The observations she made during her out-of-body experience were correct, but her normal sensory functions explained all her observations. She was fully conscious when brought into, and out of the operating theatre, so she saw the people in the operating theatre, their clothing, the instruments, and the anesthetic machine at the left-hand side of the operating table. She saw all these things before, and after her operation. She was apparently conscious for a short time at the moment when she moved slightly. But at that moment, her brain and the rest of her body were still affected by the anesthetic drugs she had received. So she felt no pain from the operation she was undergoing, nor was she able to speak and tell people what was happening at that moment. In fact she did not even think of speaking during the experience. The effects of low concentrations of general anesthetic and muscle paralyzing drugs caused her muscle spindles to function abnormally. Her slight movements caused her abnormally functioning muscle spindles to generate a flood of sensory nerve signals about her body movements, weight, and position. Her brain malfunctioned due to general anesthetic drugs, so she interpreted this flood of abnormal sensory nerve signals in such a way that she perceived herself as being outside her body, as well as generating an autoscopic hallucination. Finally, she was able to remember her experience after awakening. Her out-of-body experience was a product of abnormal muscle spindle and mental function occurring during reflex movements while under the influence of anesthetic drugs. This woman was simply conscious and aware while supposedly unconscious under general anesthesia. So how do anesthesiologists assess the level of consciousness of a person under general anesthesia? There are several reasons why people lying on an operating table would imaghine themselves to be relocated outside their bodies. Consider people lying on operating tables, looking up at their reflections in operating theater lamps while half conscious, and affected by anesthestic drugs. Some may well imagine they are looking down upon their physical bodiies as illustrated in this photograph. Ketamine can also induce OBEs (see Chapter 7 in "Illusory Souls"
There are many other possible causes of out-of-body experiences during anesthesia, but these are beyond the scope of this small website.